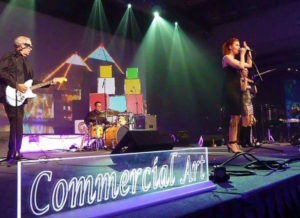 Commercial Art has been Houston’s premiere party band since 1986. This Southwest Soul Band specializes in vintage soul, classic rock, and a wide variety of music. Six decades of great dance music from 40’s swing to the present. Sound clips, photos, history are available. Commercial Art has been in constant demand in Houston’s hottest venues as well as the private party market for 16 years. An eclectic mix of classic soul, vintage rock, seventy’s funk, and a taste of Latin rhythms keeps the crowd on the dance floor. Dynamic female vocals, a rhythm section in which all members bring a distinct vocal style, and a horn section that toured the world with Phil Collins, The BeeGees, and Michael Jackson make Commercial Art Band one of Houston’s most entertaining bands to watch. Listening to Commercial Art Band is like taking a course in the best dance music of the last 60 years. The Houston band covers swing, vintage soul, classic rock, as well as Cuban Son music in a seamless eclectic mix that makes the toughest crowd want to get up and dance. When it comes to variety, few bands can top Commercial Art’s repertoire, music that takes the listener from 40’s swing, to the classic rock of the 50’s and 60’s, vintage soul and 70’s funk to the present and everything in between.